PROPOSED NEW WHALE RESTAURANT ON OUR WHARF. (or “Come Back Coastal Commission!! 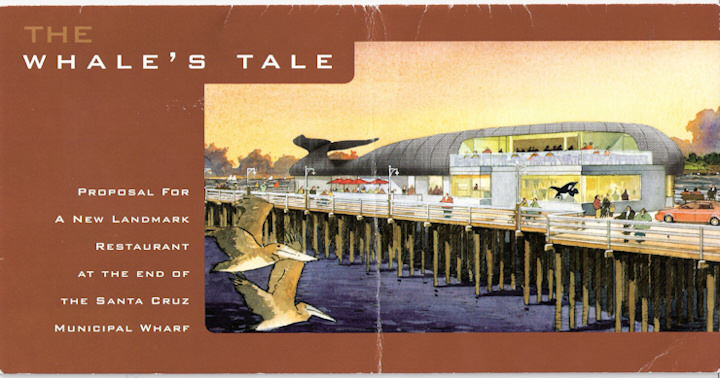 !”) Mark Gilbert who owns the Dolphin Restaurant, Gilbert’s Firefish Grill and Woodies Café all on the Santa Cruz Municipal Wharf wants to re-build and diminish the size of the public toilets, eliminate one seal- watching hole, add a gift shop and build this two story whale topped restaurant at the end of the wharf, that will be the size of the entire Olita’s Cantina building. Plus he’s devised a “Rube Goldberg device that creates an intermittent whale spout from the roof”. He will be asking for our opinions as soon as he can establish a dedicated phone number or website. In what he told me was an “exclusive interview” he said that Mayor Coonerty loves it, John Robinson (Lynn’s husband and former Boardwalk flack) thought “it was very ambitious and we need it”, David Terrazas “loved the idea and suggested that I get brochures to the City Council”, and Katherine Beiers thought it was “too big”. Gilbert thinks it’s “a really cool idea” and that cleaning the Gull poop off the metal covering would only be a monthly job. Would this Whale’s Tale Restaurant be much closer to The Duomo in Florence, St. Peter’s in Rome, or The Alhambra in Grenada [sic] than the La Bahia? MARIACHI GROUP SERANADES A BELUGA WHALE. Kate Minott found this most apt clip. SEWING WILD GLOATS OR, THE DEFEAT OF THE TERRIBLE LA BAHIA PLAN. Bumblings and mumblings around the County are saying the reason and drive behind Cynthia Mathews long time pushing Ryan Coonerty’s battle for the Coastal Commission seat that Mark Stone won became very clear last Thursday when the Coastal Commission voted against the Barry Swenson-Charlie Canfield destruction and development of the historic La Bahia into their La Behemoth. LA BAHIA REPORT FROM DON WEBBER. I asked Don Webber the head spear carrier, organizer, and spokesperson for Build A Better La Bahia to write BrattonOnline a summary, a reaction to last Thursday’s Coastal Commission meeting. Here are some excerpts of his 1000 word report….”After years of turning a deaf ear to warnings that their ambitious plans for a new beach hotel (170,000 sq. ft) on the La Bahia site would likely run afoul of the Coastal Act, city officials and business boosters were informed last Thursday by the Coastal Commission that their scheme amounted to overdevelopment of this relatively small parcel at the foot of Beach Hill”. “Commissioners, six to four, rejected the city’s application to amend its local coastal program to allow developer Barry Swenson to demolish the dilapidated landmark La Bahia Apartment complex and replace it with an upscale, resort-style, seven-story, 125-unit condominium project intended to be operated and taxed as a hotel”. “City leaders, who joined the Swenson development team a decade ago, had whipped up a hurricane of public support for the plan. For hours speakers regaled Coastal Commissioners with the promise of business opportunities and tax revenues that Swenson’s plan could engender. The majority of commissioners were unimpressed. Even local Commissioner Mark Stone ultimately voted against the city’s proposal”. SWENSON NEVER LISTENED TO THE PEOPLE. It was developers Swenson and Canfield’s choice to not just keep that large size but actually enlarge the La Bahia after being told it was not in scale. SCRP and Build a Better La Bahia members met many times with Swenson people over the years saying the La Behemoth was too large, out of code, and each time Swenson would actually come back with a larger plan. The results from last Thursday should have been no surprise. Mayor Ryan Coonerty’s stubborn belief and statements that they could fight and change any rules kept the pot boiling. BLUE WHALE IN OCEAN. PROTECTING THE OCEAN AND THE COAST. THANK YOU LETTER TO COASTAL COMMISSIONER MARK STONE. Bill Malone one of the speakers and activists opposing the Canfield – Swenson “La Behemoth” sends this letter to Mark Stone…. First of all, a Thank You to Coastal Commissioner Mark Stone. Thank you for your vote and the leadership you demonstrated at the Coastal Commission on the La Bahia issue! Your arguments supporting your vote were thoughtful and reasonable. You were wise to take a broad, unbiased view of evaluating this project as you would if the project was in some other community on the California Coast. You realized that if the developer got his way, that this could set a bad precedent not just in Santa Cruz but along the entire California Coast. I find it refreshing to see someone in a position of authority like you that has great core values and is willing to stick to them in the face of strong opposition. It is unfortunate (but not surprising) that the La Bahia proponents are lashing out at you. Obviously, they are stunned and disappointed at not getting their way. Apparently, they are only used to dealing with weak-willed folks like the Santa Cruz City Council, who are willing to change and ignore their own rules to give some developers anything they want. I am sure you anticipated the backlash and I know you are strong enough to not be too bothered by it. As I know you are aware, your job as a Coastal Commissioner is to uphold the Coastal Act, and, as I understand the Coastal Act (especially Section 30251), that is exactly what you did, as did most of your fellow Commissioners. It really wasn’t too difficult to determine that the project violated the Coastal Act in several ways. 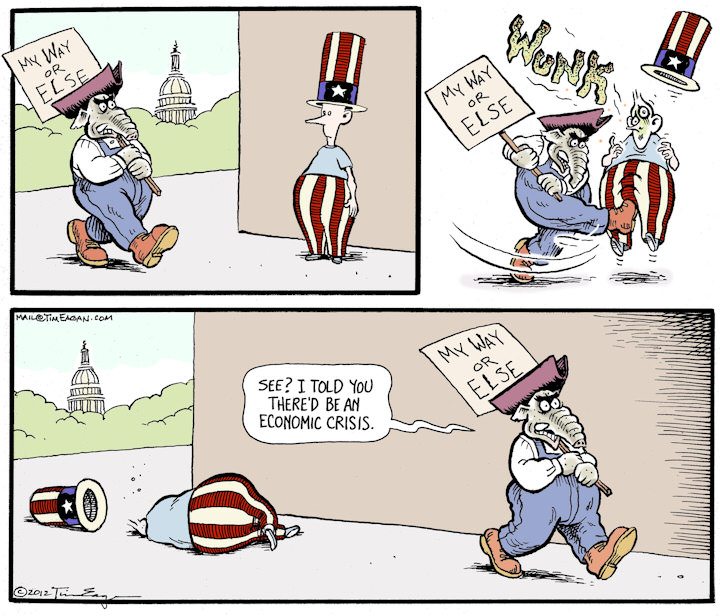 The proponents have no one to blame but themselves. They chose to ignore the Coastal Act at their peril. They wasted a lot of everybody’s time and gambled over $2 million so that they could get a big payoff. They lost their gamble. If they had designed a nice hotel project within the confines of our existing Local Coastal Plan and zoning, their hotel could have been built years ago, and the city of Santa Cruz could have been receiving tax revenues during that time. I wonder how much City Staff time and money as well as Coastal Commission Staff time and money was wasted on this La Bahia folly. The City should do an audit and inform the public how much of the City’s scarce money and time was wasted. The City Council should try a new policy of not wasting staff time and money pursuing projects that greatly overreach the City’s rules and regulations. The City officials should wise-up and stop trying to push poorly thought out projects past the Coastal Commission. This is the second time the City has tried – remember the City’s Arana Gulch Plan that the Commission criticized. Hopefully the City officials have learned that the Coastal Commission has standards and rules that they adhere to and obey. (The City Council could learn a lesson from the Coastal Commission by adhering to and obeying the City’s own rules and regulations!) I am glad California has the Coastal Act to protect our Coast for all to enjoy. And I am glad the Coastal Commission has intelligent strong Commissioners like you. SCRP PRESENCE AT COASTAL COMMISSION. Santa Cruzans for Responsible Planning is a small but dedicated group, and quite often even too shy to identify them selves as members. SCRP’ers speaking at the Coastal Commission meeting last Thursday were Don Webber, Bill Malone, Aldo Giacchino, Ron Pomerantz, Ralph Meyberg and Patricia Matejcek. SCRP members Celia Scott and Ren Curry wrote letters to the Commission, and were unable to attend. Attending that meeting as supporters and not speaking (and giving up speech time were Fred Geiger, Susan Martinez, Reed Searle and me. Swenson has “penciled out” and has constructed many other restorations, refurbishes, and restructures but somehow couldn’t make La Bahia Pencil Out??? No one including The City Council, The Coastal Commission or the people, ever saw any proof or line item statements why or how La Bahia didn’t “pencil out”. It was only Jesse Nickell’s “Not pencil” statement or claim that was accepted. Why didn’t any officials ask for proof of Swenson not being able to afford restoration at La Behemoth but did in many other locations?? UNION PRESENCE AT COASTAL COMMISSION AND THROUGHOUT THE BUILD A BETTER LA BAHIA CAMPAIGN. Union members from various unions Ned Van Valkenburg, Mark Weller and Glen Schaller all spoke at the Commission meeting. They spoke and worked in the campaign as neighbors, concerned citizens, and as folks who care about our Coast and the environment. MARRIOTT’S NEW HOTEL IN SCALE AND NO PROBLEM. As everyone should know by now there’s a new 150 room 4 story Marriott’s Courtyard Hotel going to be built in Beach Flats. There will be meeting rooms for 242 people and parking for 200 cars. They are knocking down the Peter Pan, Big Six and Super 8 Motels to do this construction. There has been no opposition to Marriott’s plans. They are within scale, within code, and proves that La Behemoth was just poorly planned. Speaking of motels, a friend stayed at The Paradise Inn on Second Street last Friday night (8/12), and woke up in the middle of the night having been bitten by bedbugs. Worse that that she saw them crawling around her bedsheets. Anyone else have that experience with bedbugs lately? ELERICK’S INPUT We are fortunate to have a Coastal Commission and Local Coastal Plans. I’m sure everybody who’s been interested in La Bahia knows what happened at the Coastal Commission meeting at Watsonville’s City Hall on last Thursday August 11th. The day started out great by finding that Watsonville’s city leaders provided FREE PARKING there at City Hall. The day ended on a great note too. In case you missed it, the City’s request for amendments to our Local Coastal Plan that would allow La Bahia to be demolished and replaced by a much larger and higher structure was rejected. You can watch the whole hearing on the Coastal Commissions website. I attended the entire hearing that stretched out from about 10:00 A.M. to 7:00 P.M. However, in the end the city and developers stuck to their intractable position that with “only” 108 rooms, they couldn’t include their Conference Center feature. Actually, the hotel could have been built three years ago and have been in operation now, if only it was kept at 108 rooms. It’s hard to believe that 17 less rooms out of 125 would not still work for the right Conference Center/Hotel-Condo developer. Santa Cruz resident Ed Davidson pointed out the impact a taller La Bahia would have on existing ridgeline views, saying that he thought the proposed building height would block a view of Mt. Everest even if it were only 15 miles away! (Paul Elerick is the chair of the Campaign for Sensible Transportation, http://sensibletransportation.org , chair of the Transportation Committee of the Santa Cruz Group Sierra Club. and is a member of Nisene 2 Sea, a group of open space advocates). On Monday Gary had this to say about last week’s La Bahia decision… “In 1972, local governments were approving development projects that were rapidly degrading coastal resources. In response, the people adopted an initiative measure to require local decisions to conform to state coastal protection policies. In 1976, the Legislature enacted the California Coastal Act, superseding the initiative measure. That law set up the system in place today. The basic premise of the Coastal Act is that local governments will first adopt a Local Coastal Plan that they think conforms to state coastal protection policies; once the Coastal Commission agrees, and has signed off on the so-called “LCP,” the local government can then make any decision it wants to, as long that decision is consistent with the local plan. The La Bahia project was, admittedly, inconsistent with the City of Santa Cruz plan. In other words, the City and the developer were asking the Commission to change the local plan to conform to the proposed development project, instead of proposing a project consistent with the plan. To its credit, the Coastal Commission has been very strong in upholding the idea that projects should follow the adopted plan. This was just another example. And from an overall view of how we hope to protect our coastal resources, and to make sure we don’t return to the way things were prior to1972, that’s just the right approach. Read the rest of his week’s broadcasts here. VINTAGE DE CINZO. 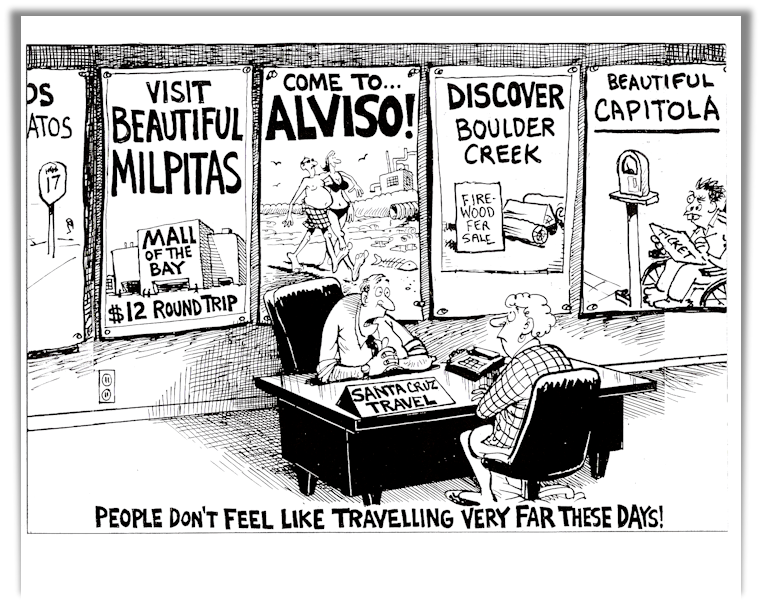 DeCinzo deals with today’s tourism…scroll down. EAGANS DEEP COVER. Tim vents about elephants and their way…scroll below. LISA JENSEN LINKS. This week at Lisa Jensen Online Express (http://ljo-express.blogspot.com/), how to cure the summer blahs with a couple of incendiary new movie thrillers, and a tasty sneak preview of Laurie King’s new Mary Russell-Sherlock Holmes mystery (in which our redoubtable heroine and hero temporarily forsake bees for pirates). Lisa Jensen has been writing film reviews and a column for Good Times since 1975. POINT BLANK. I always suggest checking out Rotten Tomatoes.com to see what other critics say about a film…and they give this one a huge and rare 91% positive. That means this is a great, great thriller that never lets up. Perfectly acted, fine photography and a kidnapping plot plus murder just keeps you thrilled all the way through. Hurry and see this. SARAH’S KEY. Kristin Scott Thomas can do no wrong when she appears in a film and this is a near masterpiece. It’s about how the French (not Nazis) in the Vel‘ d’Hiv Roundup in 1942, when the Nazi-affiliated Vichy government arrested over 13,000 Parisian Jews. It’s shocking news to most of the world and it’s also an excellent film….go see it. THE WHISTLEBLOWER. Rachel Weisz plays a Nebraska born US Contractor employee sent to Bosnia to keep the peace. She finds out that her company is full of evil money driven sadists who do human traffic….a true story. It’s nasty, cruel, inhuman and a well done film.Go see it. THE HELP. It’s 1960 in Mississippi and a young girl writes a story about what it’s like to work as “colored” help from the Help’s point of view. It’s a Spielberg film distributed by Disney, which means it’s a bit Hollywood, glossy, and could have been more challenging and gutsy. It was an embarrassing time in our Southern USA history and needs more honesty before we can ever hope to end it. Go see it. DEVILS DOUBLE. This is one really strange film about a guy who’s a double for Saddam Hussein’s son. I never understood why they made this “film based on fact”. It’s cruel, vicious, insane and beneath humanity. What’s the point except to tell us being Hussein’s son’s double was a sad and sorry job. Forget about it entirely. 30 MINUTES OR LESS. Up to and including Social Network Jesse Eisenberg was fine and funny OR serious in every role. This 30 Minutes flop flick isn’t worth 3 minutes of your time. I walked out after about 20 minutes and I rarely walk out of a film. Don’t even rent it, and don’t ask about the plot, there isn’t one. HEREAFTERHERE: A SELF-GUIDED TOUR OF ETERNITY. Tandy Beal directs the latest incarnation of last years sold out production September 9-11 at Cabrilho College. HereAfterHere is a multi-media dance-theatre experience combining original music, video, theatre, dance and interviews based on people’s concepts of an afterlife. The performance combines Ms. Beal’s long-term investigation of dance, visual narrative, illusions, text and music to make a rich mosaic of both contemporary and traditional concepts of the afterlife. If there is an afterlife, where is it located? Why is it exclusionary? How do we get in and….. what’s the price of admission? With over 25 dancers and actors, original music composed by Jon Scoville, video segments by Jess Damsen, Denise Gallant, Ben Jaffe, Bruce Lee and Nada Miljkovic. It also features Guggenheim fellow Ellen Bromberg and galactic videos from the DVD “View From the Center of the Earth²” by Joel R.Primack and Nancy Ellen Abrams. Go to the website tandybeal.com/hereafterhere it’s a forum for the public to share their thoughts, some of which will be included in the show. The September 9 performance will benefit Hospice of Santa Cruz. A $50 donation per ticket includes premiere seating and an invitation to a private reception before the performance, located at the Cabrillo Music Recital Hall at 6pm. Regular priced tickets are also available for the opening performance (see below). When: Friday and Saturday , Sept. 9 & 10 at 7:30 pm, Sunday, Sept. 11 at 3:00 pm at Cabrillo Crocker Theater, 6500 Soquel Drive, Aptos. HOUSE OF BLUE LEAVES. Santa Cruz’s Jewel Theatre Company presents “House of Blue Leaves” by John Guare September 8-25, 2011. Their press release says, “See the play the Wall Street Journal recently hailed as “A modern masterpiece. Wildly funny, yet you go home feeling stunned. One of the best American plays of the 20th Century.” Set in Sunnyside, Queens, on the day Pope Paul VI visited New York in 1965, The House of Blue Leaves centers on Artie Shaughnessy, a zookeeper who dreams of making it big in Hollywood as a songwriter for the movies with the help of his childhood friend, film director Billy Einhorn. Desperate for a better life with Bunny, his flamboyant neighbor, Artie must first deal with his schizophrenic wife (aptly named Bananas), his AWOL son, a trio of impulsive nuns, and a hard-of-hearing movie star, all looking to make their own dreams come true. At once dark and zany, House is one of Guare’s most powerful works, presenting timeless, dramatic themes – the power of celebrity, the desire for fame, and the longing to escape to a better life – in a screwball comedy plot“. It’s directed by Susan Myer Silton and has a great cast. Go here for tickets and details. UNIVERSAL GRAPEVINE. Each and every Tuesday from 7:00-8:00 p.m. I host Universal Grapevine on KZSC 88.1 fm. or on your computer (live only, or sometimes old programs are archived. (see next paragraph) and go to WWW.KZSC.ORG. This Tuesday (Aug. 16th ) Rob Blitzer from the Blitzer Art Gallery in the old Wrigley Gum Factory will talk about art. Following Rob, Audrey Stanley will tell us inside secrets from this season’s Shakespeare Santa Cruz. Tuesday Aug 23rd has Wilma Bonet from The San Francisco Mime Troupe in town and previewing their performances the 27 & 28th. Susanna Waddell talks about the Mary Warshaw Show also on the 23rd . City Museum Director Dan Harder returns August 30. Jewel Theatre’s Chad Davies and Mary James talk about The House of Blue Leaves on September 6th. Sept. 13 KUSP’s Opera host Jim Emdy and I will discuss up coming Opera seasons. September 20th has Christopher Krohn discussing one of UCSC’s student programs, then that same program, Rita Bottoms author of the new book “riffs & ecstasies” will talk about that book.. Do remember, any and all suggestions for future programs are more than welcome so tune in and keep listening. QUOTES. “We haven’t had a real hotel here in over 100 years”, Gary Griggs Director of UCSC’s Marine Sciences. “This was my last shot“, Jesse Nickell of Barry Swenson Builders. “That’s what Santa Cruz needs, actually—something that stands out and is magnificient”, George Ow local developer.